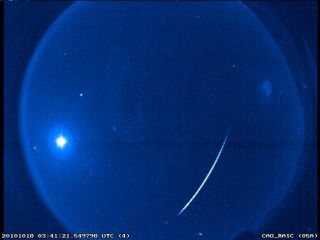 Orionid meteors will begin to increase noticeably around Oct. 17, when they'll start appearing at about five per hour. After peaking on the morning of Oct. 22, activity will begin to slowly descend, dropping back to around five per hour around Oct. 26. The last stragglers usually appear sometime in early to mid- November. Halley's Comet has left a visible legacy in the form of these two annual meteor showers, one of which is the Orionids. This will be a good year to look for them, since the moon will have slimmed down to a crescent on the morning of the Orionids peak, and will not pose much of a hindrance for those watching for Orionids in 2011. This slender moon will not rise until around 2 a.m. local daylight time. These tiny particles — mostly ranging in size from dust to sand grains — remain along the original comet's orbit, creating a "river of rubble" in space. In the case of Halley's Comet, which has likely circled the sun many hundreds, if not thousands, of times, its dirty trail of debris has been distributed more or less uniformly all along its orbit. When these tiny bits of comet collide with Earth, friction with our atmosphere raises them to white heat and produces the effect popularly referred to as "shooting stars." The orbit of Halley's Comet closely approaches the Earth's orbit at two places. One point is in the early part of May, producing a meteor display known as the Eta Aquarids. The other point comes in the middle to later part of October, producing the Orionids. The best time to watch begins from 1 or 2 a.m. local daylight time, until around dawn, when the shower's point of origin (in Orion's upraised club, just north of the bright red star, Betelgeuse) is highest above the horizon. The higher this point, called the radiant, the more meteors appear all over the sky. The Orionids are one of just a handful of meteor showers that can be observed equally well from both the Northern and Southern hemispheres. This meteor shower is one of the better annual displays, producing about 15 to 20 meteors per hour at its peak. Add the five to 10 sporadic meteors that always are plunging into our atmosphere and you get a maximum of about 20 to 30 meteors per hour for a dark sky location. Most of these meteors are relatively faint, however, so any light pollution will cut the total way down. The shower may be quite active for several days before or after its broad maximum, which may last from Oct. 20 through Oct. 24. Step outside before sunrise on any of these mornings, and if you catch sight of a meteor, there's about a 75 percent chance that it likely originated from the nucleus of Halley's Comet. "They are easily identified … from their speed," write David Levy and Stephen Edberg in "Observe: Meteors," an Astronomical League manual. "At 66 kilometers (41 miles) per second, they appear as fast streaks, faster by a hair than their sisters, the Eta Aquarids of May. And like the Eta Aquarids, the brightest of family tend to leave long-lasting trains. Fireballs are possible three days after maximum." Recent studies have shown that about half of all Orionids that are seen leave trails that lasted longer than other meteors of equal brightness. This is undoubtedly connected in some way to the makeup of Halley's Comet. So it is that the shooting stars that we have come to call Orionids are really an encounter with the traces of a famous visitor from the depths of space and from the dawn of creation.